Walnut Suite in Toronto's fashionable west end. Property 9: Walnut Suite in Toronto's fashionable west end. Upscale--FREE: Wi-Fi + Prkg + Laundry + Binder of Shopping, Social & Good Eats! Property 15: Upscale--FREE: Wi-Fi + Prkg + Laundry + Binder of Shopping, Social & Good Eats! Brand New One Bedroom Condo Close to Airport! Property 19: Brand New One Bedroom Condo Close to Airport! 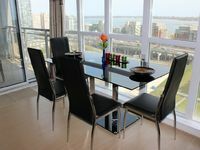 Property 26: Luxurious Suite With Free Parking, Amazing View, Heart Of Toronto! ANNEX Toronto downtown deluxe, 2 story, 2 bedroom, quiet, steps from everything. Property 40: ANNEX Toronto downtown deluxe, 2 story, 2 bedroom, quiet, steps from everything. A One Bedroom Main Floor Suite On Stanley Park In Toronto. Property 42: A One Bedroom Main Floor Suite On Stanley Park In Toronto. Property 45: Trendy & Elegant 1 Bdrm Condo. Prime Location !! Breathtaking Lake View !! Property 47: Beautiful Studio apartment across the lake in the "Beaches"
My family and I absolutely loved our stay in Toronto mainly due to the great apartment and how close it was to most of the major downtown attractions. The rooms were clean and bathrooms very well kept. We had clean sheets, towels, and living quarters. We were also very happy there was a grocery store right down the street. You are within 15-30 minute walking distance of many major attractions as well. Would recommended 11 out of 10 stars!